We’ve all seen the 30 for 30 series from ESPN that focuses on some of the most fascinating sports stories ever told. That series inspired me to focus on specific Indiana University athletics stories that merit significant attention. This post presents a series of “what-ifs.” It is fun to wonder about what the impact might have been — not only for the athletic program but the university itself — had any of these circumstances actually occurred. Any of them could have significantly altered the course of collegiate sports history. 1. 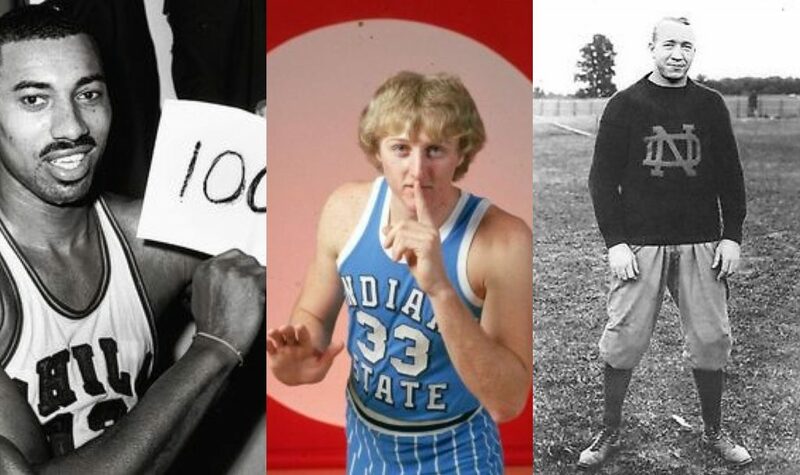 What if … Larry Bird had stayed and played at Indiana? Larry Bird was an NBA legend for the Boston Celtics from 1979-1992. He led the Celtics to three NBA Championships and was named the Most Valuable Player in the league for three straight seasons from 1984-1986. However, Bird’s story began in tiny French Lick, Indiana, about 50 miles south of Bloomington. Bird’s affinity for the game of basketball was evident as he became the star for Springs Valley High School. As a senior during the 1973-74 season, Bird averaged 30.3 ppg and 13.3 rpg en route to becoming the school’s all-time leading scorer and being named an Indiana All-Star. Despite over 50 universities and colleges pleading for his services on their basketball team, Bird narrowed his list to Indiana, Purdue, and Indiana State. Bird was ultimately drawn to the lure and mystique of the Indiana program, like many in the basketball-crazed state. He met with coach Bob Knight and signed his official letter of intent in late April of 1974. 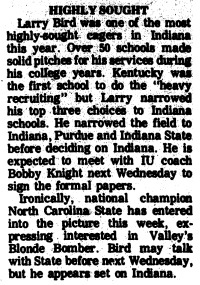 This snippet from the April 10, 1974 edition of the Jasper Herald mentions Bird’s intention to sign with Indiana. Once he arrived on the IU campus that fall, Bird began to feel the size of Indiana University and Bloomington overwhelm him. Having grown up in a town of only 3,000 people, Bird felt isolated and very much an outsider. Not only that, but he wasn’t exactly receiving a warm reception from some of soon-to-be teammates. Wayne Radford, who was entering IU as a freshman like Bird, and who had been a teammate of Bird’s on Indiana’s All-Star team, remembered that Bird was often overlooked in pre-season pick up games at Assembly Hall. College basketball insider Seth Davis’s book When March Went Mad outlined other obstacles that Bird faced that fall, including being constantly chastised by IU big man Kent Benson. Additionally, Davis’ book outlined how Indiana coach Bob Knight constantly gave Bird the cold shoulder during their limited interactions. All in all, Bird felt out of place, and felt that staying put in Bloomington was not an option. He eventually left the campus without telling any of the Indiana coaching staff, only speaking to his roommate Jim Wisman. Bird eventually found himself in Terre Haute, enrolling at Indiana State University in the fall of 1975. Following a redshirt season, Bird became an instant success on the hardwood. He led his Sycamore team to the 1979 NCAA National Championship game, falling to Magic Johnson and the Michigan State Spartans. Bird graduated from ISU with a career 30.3 ppg average, was named the National Player of the Year in 1979, and went on to have a prolific NBA career with the Boston Celtics. But can you imagine Bird playing for Bob Knight and the Hoosiers instead of the Sycamores? Bird would have been on Indiana’s undefeated 1976 national championship team — which is just mind-boggling to think about. And remember — after dominating in 1975 and 1976, Indiana dropped off to 14-13 overall and 9-9 in the conference in 1977 even with senior Kent Benson and freshman Mike Woodson. With Bird, the Hoosiers likely would have stayed right near the top of college basketball. Moving beyond that season, players like Bird, Woodson, Ray Tolbert, Randy Wittman, and others would have carried the torch until Isiah Thomas’ arrival in 1980, and the Hoosiers might have enjoyed the kind of sustained dominance very few programs (perhaps only UCLA) ever have. We’re left to do nothing but wonder. 2. What if … Branch McCracken, not John Wooden, had become the Wizard of Westwood? Branch McCracken talks with his team during a game against Minnesota, 1953. Photo: courtesy of Indiana University Archives. Emmett “Branch” McCracken had become a Hoosier legend even before returning to his alma mater to be head coach in 1938. During his three-year Indiana playing career from 1928-1930, McCracken was one of the most dominant players in the Big Ten. In many ways, McCracken was responsible for the development of fundamentals that personify the “pivot,” or center position, on the floor. McCracken was named All-American in 1930, the same year he led the Big Ten in scoring. He graduated as Indiana’s all-time leading scorer. After a brief coaching stint at Ball State Teachers College, McCracken returned to Bloomington to replace his college coach, Everett Dean who had left to become the head coach at Stanford (and would go on to win an NCAA title in 1942). His first team finished 17-3 overall and second in the Big Ten conference (Indiana finished second in the Big Ten each season from 1939 to 1943). The following season of 1939-40, McCracken’s “Hurryin’ Hoosiers” captured their first ever NCAA title. Mac then served in WWII from 1943-1946 before returning as Indiana’s coach for the 1946-47 season. While Indiana was enjoying consistent success on the hardwood, UCLA’s basketball program was struggling to stay competitive in the Pacific-8 Conference. Following inconsistent play for several years under head coach Wilbur Johns, the Bruin athletic brass came calling upon McCracken to gauge his interest in coaching on the west coast. It was reported that McCracken was offered a salary increase as well as other incentives. Despite the enticing opportunity, and following a meeting with Indiana President Herman B. Wells, McCracken decided to stay put in Bloomington. 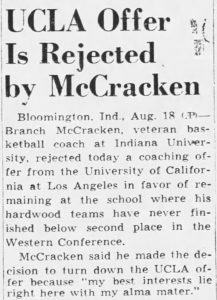 The August 19, 1947 edition of the Muncie Star Press noted McCracken’s decision to remain in Bloomington. After turning down the job, it was reported that McCracken recommended his good friend for the position: then-Indiana State head basketball coach John Wooden. UCLA stuck with Wilbur Johns for the 1947-48 season before officially hiring Wooden to a three-year contract in April of 1948. Wooden, as we all know, would go on to win ten NCAA titles during his 27-year career in Westwood en route to becoming the most successful college basketball coach in history. What might have happened if McCracken had taken the UCLA job? It’s easy to think that Indiana might not have won its second national championship under McCracken, which came in 1953. But on the flip side … what if Wooden had been offered the vacant Indiana job? It would have been a clear step up from Indiana State, but would the Purdue grad have taken the head position at his alma mater’s rival? And if he had, would Wooden have been able to create the same level of success in Bloomington that he created in UCLA? 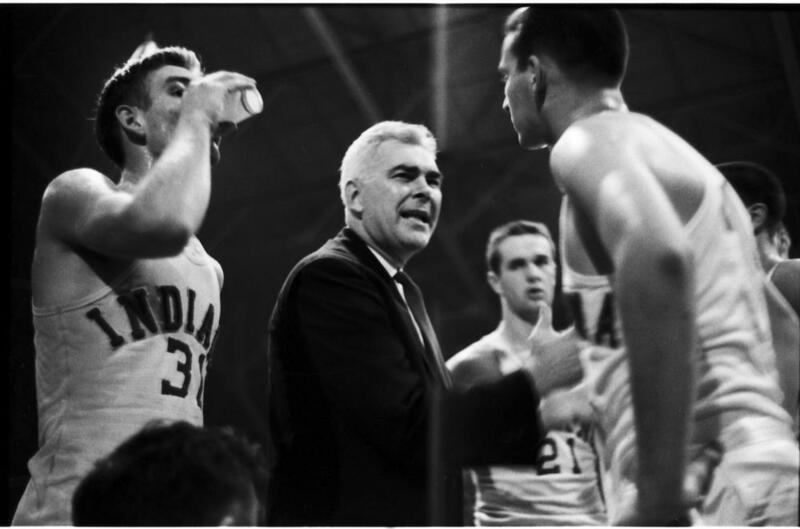 Would Wooden’s longevity have meant missing out on hiring the young coach from Army who delivered three more national titles to Bloomington? As you’ll read later, would McCracken moving on and a different coach being in place have led to different results in the recruitments of Wilt Chamberlain and Oscar Robertston? We’ll never know. But, as with Bird’s hypothetical IU tenure, it’s fun to think about. 3. What if … Wilt Chamberlain, Oscar Robertson, and Clyde Lovellette had donned the Cream and Crimson? Clyde Lovellette was the prototypical basketball-loving Indiana boy. 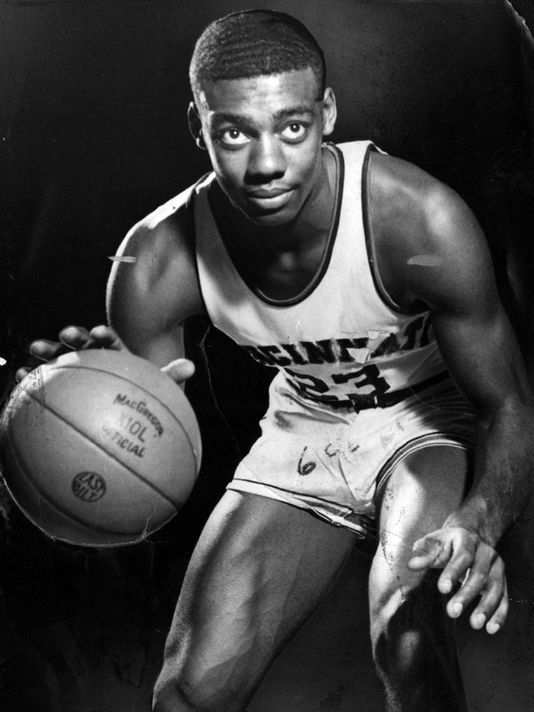 Growing up in Terre Haute, he attended Garfield High School where his dominant play down low led his team to the 1947 Indiana High School Basketball Championship. Garfield lost to Shelbyville High School, which was led by future Indiana star and IU’s first African-American basketball player, Bill Garrett. Most in the state believed that Lovellette would go to Indiana, as coach Branch McCracken had great success in luring the state’s best to Bloomington. However, Kansas, coached by Phog Allen, was able to convince Lovellette that he was the key to the success of the program (and that he had a future on an Olympic basketball team), which helped Allen lure Lovellette 447 miles away from his home to Lawrence, KS. Allen became a bitter rival and enemy to Branch McCracken following the recruiting battle, as McCracken spoke about Lovellette being “stolen” from right under him. Lovellette would go on to have an outstanding basketball career that included an NCAA title with Kansas in 1952, Olympic gold medal, and an NBA title (the first basketball player to hold that honor). Following Indiana’s NCAA title in 1953, the program was on top of the collegiate world. McCracken had proven that despite losing out on noteworthy in-state players like Lovellette, top talent continued to funnel to Bloomington. Around this time, the entire country became aware of a major talent out of Philadelphia by the name of Wilt Chamberlain. At 7’1, and remarkably agile and athletic, Chamberlain instantly became the most sought-after high school prep star in the country. To some, he was the best prep prospect they’d ever seen. Hundreds of college basketball offers poured in, and Chamberlain narrowed his list to four schools: Dayton, Kansas, Indiana, and Michigan. According to the article Can Basketball Survive Chamberlain?by Aram Goudsouzian, history professor at the University of Memphis, Chamberlain dismissed Michigan from the list due to it being a football school, and removed Dayton from the list after he was restricted to eating in his hotel room and kept away from restaurants deemed segregated in the city. This left Indiana and Kansas. 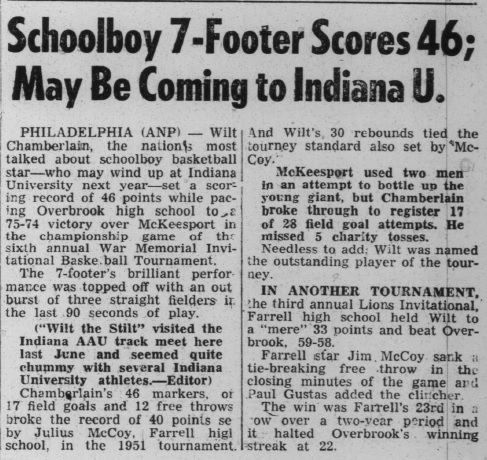 The January 10, 1955 edition of the Indianapolis Recorder hinted at the possibility of “Wilt the Stilt” landing in Bloomington. Despite the fact that Indiana had been the school to break the “gentlemen’s agreement” in the Big Ten Conference that had denied African-Americans the ability to play basketball, alleged rumors that McCracken was racially prejudiced were ingrained in Wilt’s mind from others. Similar rumors persisted about Phog Allen too. In interviews with the press, McCracken maintained confidence in the fact that Chamberlain, who had made three visits to the Indiana campus, would become a Hoosier. 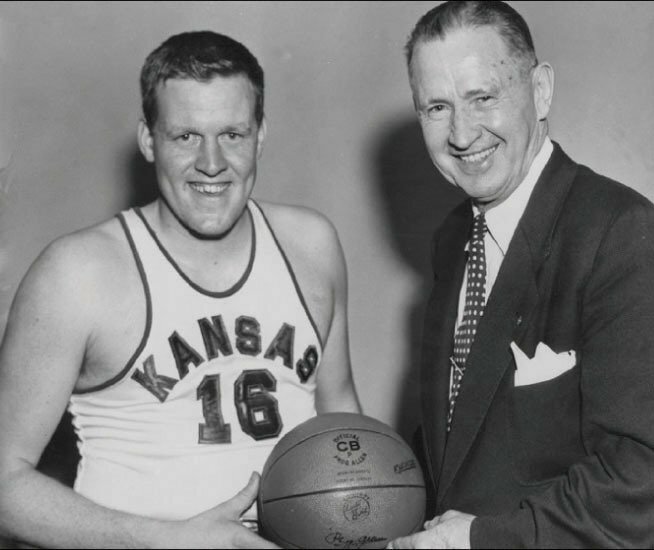 On May 13, 1955, news broke that Chamberlain had chosen to play basketball for Kansas. Allegations came about from newspapers alleging that Chamberlain was paid by Kansas, an allegation that Chamberlain would later confirm. Goudsouzian’s aforementioned article also stated that McCracken claimed he had been approached during Chamberlain’s recruitment by an agent asking for $5,200 plus room and board for Indiana to secure Wilt’s commitment. In the end, assuming McCracken’s declaration was true, he refused to comply. Chamberlain, of course, would go on to one of the greatest basketball careers in history. It would have been great to have Chamberlain in the Cream and Crimson, but in hindsight Indiana fans may rejoice that McCracken refused to resort to the seedy underbelly of “pay for play”. When Oscar Robertson became the next great prep star in the state, naturally Indiana University was considered a serious destination for his collegiate career. Robertson had led his Crispus Attucks High School squad to back-to-back IHSAA state championships in 1955 and 1956, going a combined 62-1. Robertson was very familiar with Bloomington and the IU campus, often visiting older friends who attended IU. In many ways, Robertson felt that Indiana was the perfect fit. When he visited the campus with his high school coach Ray Crowe, he really had no doubts that he wanted to become a Hoosier. However, Robertson later stated that his initial interaction with McCracken changed his mindset completely. Perhaps McCracken’s mindset at the time was to be cautious, considering how the recruitment of Chamberlain had concluded only a year earlier. Regardless, the “Big O” never considered Indiana for college after the meeting with McCracken. Robertson ended up committing to Cincinnati, where he would go on to average an eye popping 33.8 ppg career average, be named College Basketball Player of the year three times, and graduate as the university’s all-time leading scorer (a record still today) before moving on to a stellar professional career. Can you imagine how many banners might be hanging in Simon Skjodt Assembly Hall today had Lovelette, Chamberlain, or Robertson made their way to Bloomington? 4. What if … Knute Rockne had ended up on the Indiana sidelines? Clarence Childs had been a track and field star at Yale and was named to the 1912 U.S. Olympic Track and Field Team that would compete in Stockholm, Sweden. Childs took home the bronze medal in the hammer throw, which had been his specialty at Yale. Following his Olympic success and the conclusion of his amateur career, Childs was named head football coach (he lettered in the sport at Yale as well) at The College of Wooster in the spring of 1913. Following a 2-3-2 record in 1913, Childs was approached about the vacant Indiana football coaching job after the resignation of Jimmy Sheldon, who had been IU’s football coach since 1905. After officially accepting the Indiana job in the summer of 1914, Childs began to seek out a supporting cast. We are not aware who may have suggested the name to Childs to fill the assistant coach position, but a recommendation was made of a 22-year old recent graduate of the University of Notre Dame named Knute Larsen Rockne. Rockne had excelled as a football player for the Fighting Irish from 1910-1913, and he had graduated with a degree in chemistry from Notre Dame in the spring of 1914. 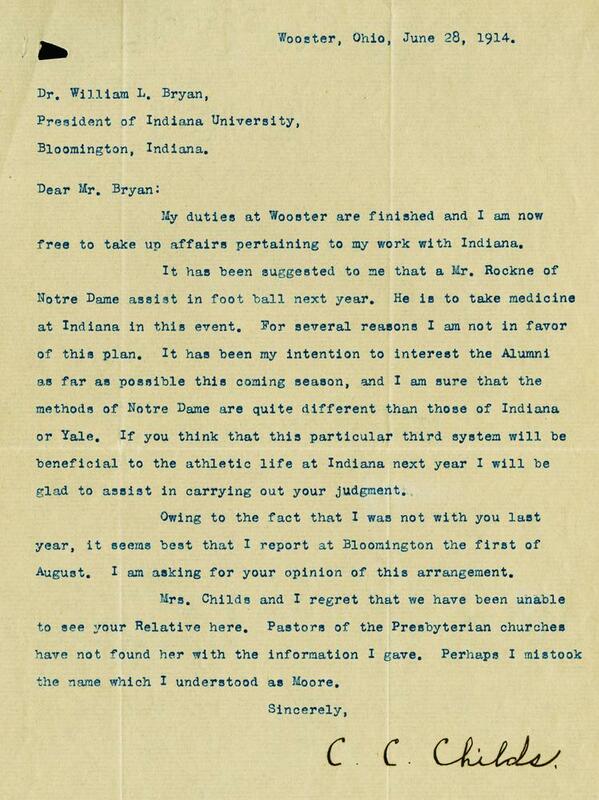 Regardless of what Childs’ motivation may have been, Rockne was not considered for the position and remained in South Bend. Following graduation, Rockne passed on medical school and pursued a professional football career while also assisting the Notre Dame team under head coach Jesse Harper. When Harper announced his retirement as head coach following the conclusion of the 1917 season, Rockne was named his successor. Rockne’s head coaching career from 1918-1930 included three national championships and a 105-12-5 total record (the second highest winning percentage all time in NCAA football history). And he could have been on the Indiana sidelines. Another missed opportunity occurred in 1972. I was a student at IUSB then and was elected student body president. That allowed me to be a student member of the All-University Sports Council and the biggest thing that came up was hiring a new football coach. What is a long-time secret is that Bo Schembeckler actively campaigned for the job and appeared before us to plead his case. He told the Council that he would take the job with one caveat: That when then-Athletic Director Bill Orwig retired that he be given that position. That was all he wanted and he didn’t ask for any particular time frame for his retirement. Only problem was, Bill Orwig wouldn’t agree to that term and so we got Lee Corso. Everyone on the Council was sworn to secrecy. I think it’s time that was exposed. Schembeckler went on to the University of Michigan, but he could have been the I.U. coach and ultimately, it’s AD. Thank you Les for this invaluable information. I had always heard the story of how Wisconsin could have had both Bo and Bob Knight, but handled the hiring situation poorly. Clearly, Bo coming to Bloomington could have been a major game changer for Indiana football forever. gloryforoldiu@gmail.com should work, just remove the period from it at the end. Great article on what might had been. McCracken probably doesn’t have the same success at UCLA as John Wooden did if he doesn’t cheat like John did starting in 1960. Also, I see that NC State, fresh off of a national title, was also trying to recruit Bird. If they had gotten him, and he could play in 1974-75 (and he fit in there), the Wolfpack may have repeated as champs and went to two more NCAA’s in the next three years.